Gina M Hall Studios: How about some Kitties?? my aunt Vi is owned by Nudge and Ted, nice job! Hi Gina! Your kitty looks like my old feral cat I care for! 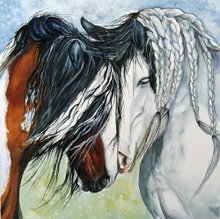 Gina, your gypsy horses are just beautiful!